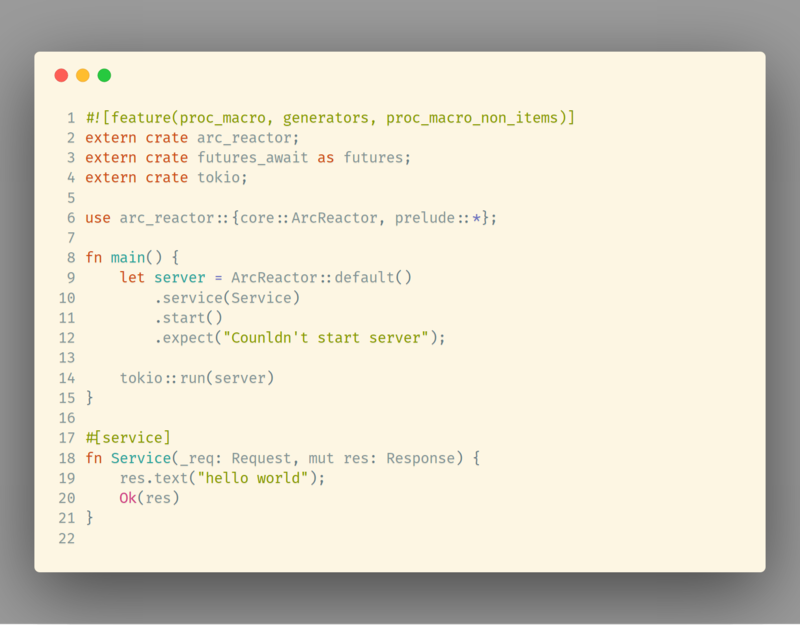 An Asynchronous, Extensible, Micro web framework for Rust. Asynchronous. 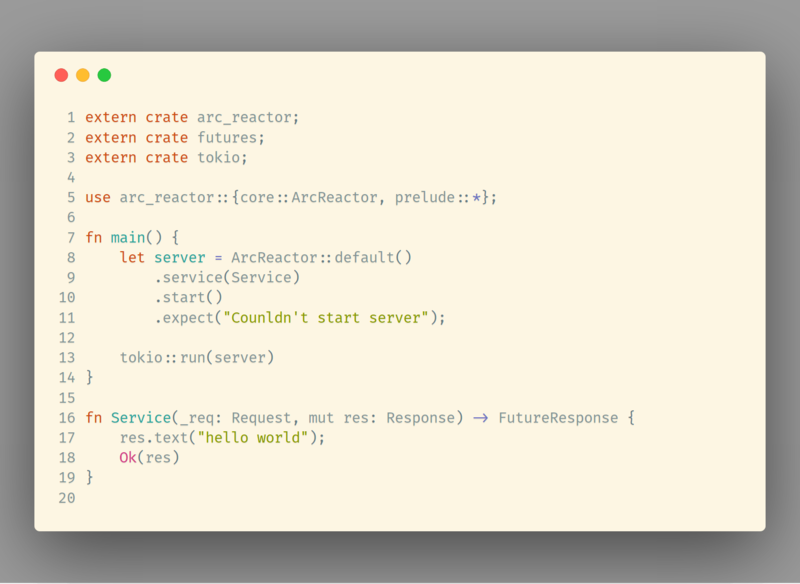 In arc reactor, Service Handlers are asynchronous by default. Integration With futures-await. The #[service] proc_macro not only derives the ArcService trait for your route handler, but also marks it as #[async] so you can await on futures in your route handlers with no extra stress. Minimalistic. arc reactor is designed to be a very thin abstraction over tokio and hyper. TLS Support. easy to add tls support. Opt-in to Nightly. arc reactor uses a lot of cool features, including proc_macros which are only available on the nightly channel, using the unstable feature flag. Originally, arc-reactor was designed for the nightly compiler. But instabilities in libprocmacro cause it to break everytime a new nightly compiler is released. So by default, arc-reactor no longer uses the nightly compiler, and will work out of the box with the stable compiler. 🎉 This means experimental nightly features including proc_macros are only available behind the unstable feature flag. If you wish to use arc-reactor, with the nightly compiler and unstable feature enabled: It is recommended that you lock down the compiler version. Until libprocmacro is stablized. futures from futures-rs is re-exported instead of futures-await. you lose the ability to await! on futures in your ServiceHandlers and MiddleWares. Currently, Multipart support is implemented using unstable features, so you would have to implement your own. Check out the examples folder and the api documentation to get a feel for how arc reactor works. It's well documented and should get you up and running in no time. It is Strongly recommended that you read the design document, as it gives you full disclosure on arc-reactor's internals, as well as the design decisions that were made. Arc-Reactor is highly extensible via middlewares which are placed in the contrib module. Feel free to submit a PR.